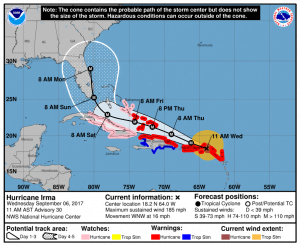 As you may be aware, all of Florida is currently in a state of heightened awareness as we monitor the track of Hurricane Irma, a very dangerous wind hurricane (Category 5 level of sustained winds over 157 mph or 252 km/h) and the eye estimated to reach “somewhere” over the southern tip of Florida around 8 am Sunday morning. Our local grocery stores have been emptied of water and literally everything that doesn’t need to be refrigerated or cooked in expectation of power outages. People are very scared and with good reason. Tempers are flaring as people wait in long lineups to gas up their vehicles and two of the three counties south of Palm Beach County where Robert and I are located have issued mandatory evacuations. Since there is basically one major highway I-95 North to get out of Florida, I’m guessing it’s starting to look like a parking lot. Hotels in Georgia are reportedly all booked up. Gas is already at a premium and when cars begin to run out of fuel while on the highway … not a pretty sight. We have our personal plans in place and today are getting our things together in readiness to leave home if need be for our safety although honestly at this point we have no clue in which direction to head, there are no good options. I will be getting a few tangles ready to keep you going for the next few days, but if I “go quiet” for the first time in the history of TanglePatterns, it just means that we’re doing our best to remain safe. And I will be back as quickly as I can. Of course I’m praying that all will continue as usual. This is the latest projected track as of 11 AM this morning from the NOAA National Hurricane Center. Diamond Heart is from Taiwan CZT Ginny Lu. You’ll recall it was her daughter Jenny who shared her Heart Flower tangle with us on Monday. Inspired by the pattern she noticed on this box — “really very ancient Chinese window style” — Ginny set about deconstructing a version of it to create her Diamond Heart tangle. Diamond Heart is an easy-to-draw grid-based tangle. Notice that the corner squares of Step 1 take about 1/4 of the width (or length) of the grid square. If you make them too much larger you could run into difficulty trying to fit the rest of the tangle strokes into that grid square (fragment). Voice of experience. 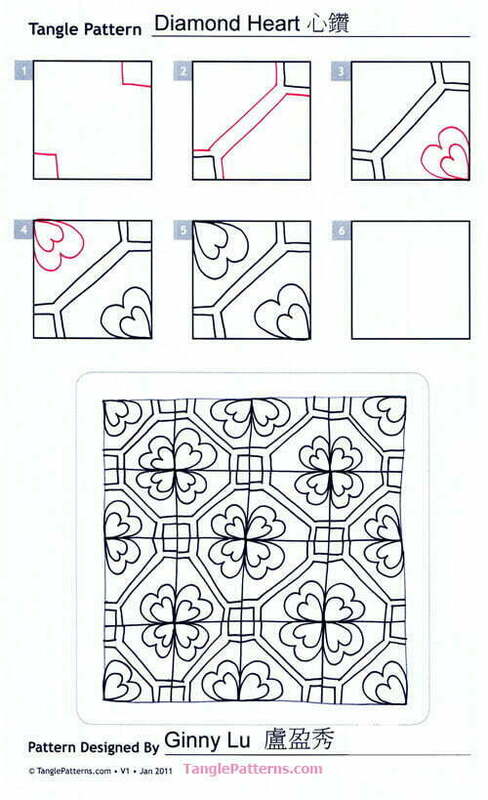 Ginny illustrates the step-by-step instructions for drawing Diamond Heart below and features it in a straightforward monotangle. 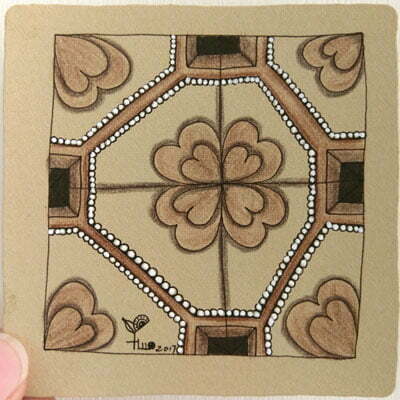 This is Ginny’s Renaissance Tan Zentangle tile example of Diamond Heart highlighted with color pencils. 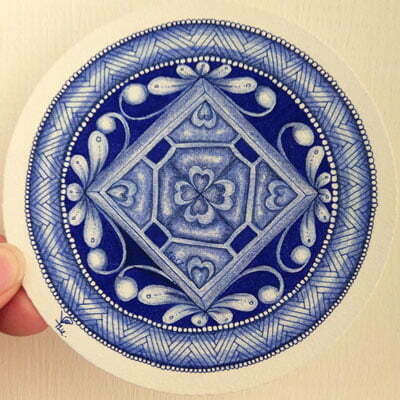 Here Ginny demonstrates her tangle on a beautiful White Zendala tile using gorgeous blue inks that remind us of Holland’s Delft Blue china. 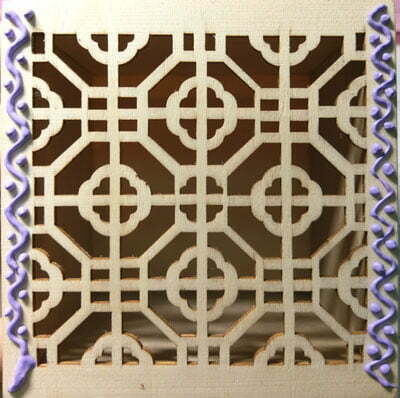 The Zentangle-originals Mooka, Flux and Hibred frame the Diamond Heart focal point of the tile. Check out the tag ginnyl for more of Ginny’s tangles on TanglePatterns.com. Linda, I’m hoping and praying you will not have to evacuate and that all continues well for you. If not, please know our thoughts are with you and your family. Best of luck to you! Thanks for the tangle today Diamond Heart. I’m going now to my drawing table to play with it. Wish you much love and safety, hope the hurricane misses land altogether. Good luck to you and your family. Thoughts, prayers and love to you and your family, as well as to all in the path of Hurricane Irma. Ginny – I see several new fragments in this tangle. I’m eager to try them on different reticula. Many thanks. Linda – You and your family are in my prayers. Stay safe. Thinking of all the people in the path of this major storm. Stay safe! You and all of the people in the path of the hurricane are in my thoughts and prayers! Linda, I do hope you and Robert will be safe from Hurricane Irma; sorry if you have to leave home and I wish you the best of luck on the highways! I `ll be thinking of you, especially if you “go silent”. Hope you are well stocked up on non-cook food and so on! I also LOVE Ginny`s new tangle and will be trying it out soon, maybe even this afternoon. I just love Grid tangles! I hope you’re not in the path of the storm. Stay safe! I like It! Especially your freehand monotangle that isn’t perfect. It gives me hope, because my Tangles are off kilter too. The blue delft tile is gorgeous and reminder ds me of a Kaleidescape. Your daughter’s Heart Flower is very sweet and delightful. Thank you for sharing your gift with us. Linda, I feel for you. I also live in the Sunshine State, Queensland, Oz. I have been in three floods and it’s so psychologically damaging. The mud afterwards is terrible. I can’t decide if you are crazy or in denial by ensuring new tangles are part of your evacuation plan. Shows your total passion. I wish you the very best. This is on our news in Oz so will follow more closely now. Thank you. Dear Linda and Robert, Safe travels on your evacuation. I hope you take lots of paper and pens to tangle your way to safety. I envision you using your tangle skills teaching others who need a way to manage the stress of Irma. Looking forward to your, “We are Safe!” message! Thank you for all you do with this site now go take care of you! Our thoughts and prayers are with you from your friends across the Ocean in the United Kingdom. Love hearts, but as for the storm please be safe. Will be praying for Florida as I we here in Houston recover. God Bless you and yours. Keep safe, Linda. Thinking of you! Take care and stay safe. Don’t worry about us; you’ve given us plenty over the years. Our hopes and prayers are with you all. Dear Linda, I do hope that you and Robert will be safe. Please take good care. This doesn’t sound good at all. So I’ll just pray for winds of lesser magnitude than announced. Please know that you’ll be in my thoughts. Lots of love! Thanks for a lovely tangle. All of you stay safe. Don’t worry if you can’t post for a few days We will all understand. This is a great grid pattern. I love that it’s from a very old Chinese window pattern. Thanks for sharing it with us Ginny Lu. Linda, I know you will be safe. I read all the above messages and I don’t know what more I can add. Except for: Don’t forget to breathe. Our breath steadies us and we can see clearer. Just like Rick and Maria say to start tangling on a new tile. But you know all that. Now it’s time to take care of yourselves. May your home come through it all with little or no damage. It’s hard living in the UK, with our tame weather, to truly comprehend what you must be facing at the moment. But the news reports give me some idea. I hope you, your loved ones and your home stay safe through the days ahead. The example of the delft blue zendala is beautiful! Linda I hope when you read this you and your family and friends are all well. I really appreciate all you do!